Some regions of the country have landscapes marked by sparkling snowscapes and vibrant evergreens. We may not get much snow for our holiday landscapes in Woodstock, but we certainly don’t lack color. If your yard is looking a little brown, revitalize it with these 6 winter shrubs to plant in Woodstock. Holly: There’s a reason we deck the halls this time of year. Boughs of holly have rich, glossy leaves in deep green tones. 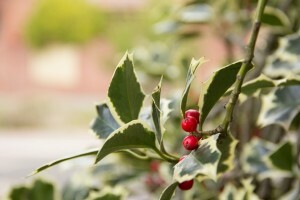 Most holly bushes also have bright red berries that add festive cheer to your yard. Plum yew: These deer-resistant evergreens have dark, shiny leaves reminiscent of needles. Plum yew shrubs grow into nice hedges and make for excellent ground cover. Evergreens are ideal for adding life to dormant Woodstock landscapes. Yellow twig dogwood: Although they bloom in the spring, yellow twig dogwoods provide striking winter color due to the golden hue of their branches. Call Hutcheson Horticultural for all your winter Woodstock landscaping needs.